THIS CLASSIC PROPERTY SIGN shipped to Charlestown, Massachusetts – the oldest neighbourhood in Boston. The simple handcrafted and brush textured sign with the look of wood is a perfect fit to this historic spot. On a peninsula just north of the Charles River and across from downtown Boston, Charlestown is also near Boston Harbor and Mystic River. Steeped in history, the town was first laid out in 1629 and it was the first capital of the colony. A big percentage of settlers were Irish who migrated during the great Irish famine in the 1840’s, and it still has a strong Irish American identity though the population has diversified over the years. Boston’s Freedom Trail has its northern end here at Bunker Hill, where the famous American Revolutionary War battle took place. This is also the place from which Paul Revere started out on his well known midnight ride just before the Battle of Concord, and there is even a restaurant operating, Warren Tavern, which is said to have been one of Revere’s favorite hangouts. 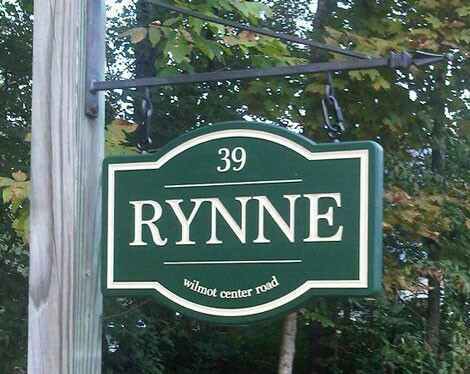 This property sign was designed by the family using Danthonia’s sign designer tools, where they were able to choose from among literally hundreds of options – artwork, sign shape, colors, text style, edging, texture, size, etc. When they were happy with their design, they ordered it online and within 24 hours, received a polished proof for their feedback and approval, before the sign went into production. Three weeks from the time they gave their approval, the sign was at their door. We love our sign! I am sending a picture with the caveat that we know we need to paint the sign post. The nice quality of the sign highlights the fact that the post needs a few coats of paint!